It was a cool summer evening and the sun was sitting low in the sky with its yellow circle just barely peaking over the horizon. There was a large field and the tall grass swayed calmly in the breeze, waving like an ocean. Only the soft buzzing of the cicada beetles rung out in air, but in the field, near a road that ran by, the swordsman was swinging his blade around. He was training. His eyes were shut and he was focusing; again moving his blade in slow precise movements. He slowly increased the speed before changing stances and the way he held his blade, then repeating. No matter how fast or what movement he did the swordsman did not make a noise, the sound of his blade cutting through the air blended with the sound of the swaying of the grass. A young woman had been walking along the path and noticed the swordsman, at first she thought he was silly, waving his sword around in a field. This was odd behavior for anyone at this time, so she continued walking. Two weeks had passed since the first guardian was announced. The program instantly went global and people began getting outfitted with both cores. The International Shadow Alliance was initiated and appointed an international military organization. Everyone who was outfitted with a core was expected to find a partner and join up with the ISA; to "defend humanity" as they put it. The woman was an activator and she walked this very same road everyday to get into town. There she looked for a partner. When the day came to a close she walked back along the road to her house. The next day early in the morning she was walking along the road and saw the swordsman again, this time holding his sword differently than before and it intrigued her. This time it caught her eye and she began notice things she didn't before. Instead of continuing her walk she stopped a moment and just watched the swordsman in the field. She noticed how he made no sound, she noticed how his style changed, she noticed the dance with the sword. After leaving her daydream she hurried into town; after all she was an activator and that meant she needed to find a guardian. The girl was beautiful in her own right, she had blonde hair that she tied off behind her head in a single ponytail and she had green eyes the color of spring meadows. She had a medium build, not skinny to the point where you could see bones, but not too large that she was in excess. She wore clothes befitting a young lady, summer dresses that covered everything, but did not cover her beauty. Her skin was fair and had a slight tan, but she was definitely on the paler side. Her green eyes stuck out the most of her features and coupled well with all her light blue and green dresses. She went into town every day, mostly to do mundane chores and pick up necessary needs. But she was always looking for the right man; the right guardian. She lived here, out in the country near Fredericksburg TX, USA. It was awfully close to the border set up to keep the shadows at bay. Today well she was in town her mind wasn't so much on searching for a man, but instead already thinking over one. The swordsman; the man she had seen in the field, he haunted her thoughts all day and she could hardly focus. The day passed quicker than normal and before she knew it, the sun was setting. She may have been distracted, but she knew well enough that she still had to get home and make dinner. She left the town and was walking along that road when she passed the field. She had instinctively turned to look where the swordsman was in the morning. Still swinging his blade he remained in the same spot, for some reason she wondered if he ever slept. She shook her head, of course he did, he has to maintain that energy somehow, she reasoned with herself. She almost had to force herself to continue walking home, and even after she lay in bed that night, she could not drift off to sleep. Had she become infatuated with this swordsman? She thought to herself, but no matter how much she tried; the swordsman and his blade danced inside her head. The sun rose and she was no more rested than when it set the day before. But still she got up, readied herself, ate and left her house. She began down the road, this time, however when she reached the field she left the road. The woman walked off the road and into the edge of the field. Slowly, she made her way through the waving grass till she was only a few feet from where the swordsman was practicing. She sat down cross legged like a schoolgirl, the grass flattening underneath her. She just sat there and watched the swordsman and his movements. She realized that he wasn't just practicing moves or swinging his blade randomly, but instead it was like he was fighting someone who wasn't there. An invisible opponent that he blocked and struck at repeatedly over and over. She put her head in her hands and continued to observe with a smile slowly creeping across her lips. Time didn't seem the same well she sat there, the sun traveled across the sky and soon it was dusk again, but to her it had only seemed like minutes. 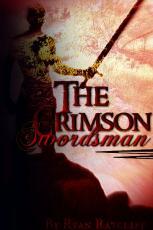 The swordsman finally stopped moving, he stood still and lowered his sword; his shoulder towards the woman. She could see his profile and she admired it as much as everything else, then she noticed his lips were moving, but she heard no sound. An audible sigh came from the swordsman, “I said, is it not rude to observe someone without their invitation?” The swordsman asked with a bored tone in his words, obviously knowing the answer. “Uh-uhm, im very sorry!” The woman's cheeks had begun to turn a faint shade of red as she lowered her head in shame. “Regardless, I would much rather know your name, you pass by here frequently so I see it only fitting if you are to continue watching me.” The swordsman replied turning towards the woman, his cold blue eyes meeting her lively green eyes. “It’s- uhm..” She lost her words, it was the first time she had seen him up close and his gaze was piercing, it felt like he could see deep inside her. “You do have a name, don't you?” The swordsman raised an eyebrow when she didn't respond. “Its Paige, Paige Calburn.” She finally found her words enough to respond. “Friend of course! I don't have any weapons on me.” Paige replied quickly this time her voice wavering slightly. “I had hoped so. Paige usually you are heading home at this time, don't you think you should keep with your habits?” The swordsman stated slowly getting into a standing position. Realizing the time Paige’s eyes widened and she hurriedly got to a standing position brushing her rear of dried grass. She was about to turn around but caught herself, her thoughts went to the swordsman. “What about you? Shouldn’t you be heading to your home as well?” Paige asked looking at him with curious eyes. “I don’t live here, I don’t have anywhere to call home or return to. I spend my time here, training since I cannot fight. And because I do not fight, I do not need rest.” The swordsman who had already turned around replied in a cold tone. Paige instantly felt sad for the swordsman and then felt bad about asking turning her gaze to the ground. After a few moments of silence she began fidgeting with her foot rustling the grass. The swordsman remained silent, the silence seemed to have spread as even the cicada beetles had stopped their buzzing. The only sound in the summer night was the sound of grass swaying and the rustling of Paige’s restless foot in the grass. After a long silence the swordsman's voice finally came out crisp and clear in the night air, “you are an activator right? Do you have a partner?” He inquired keeping motionless. “Uh, no, I mean yes, I am an activator, but no I don't have a partner.” Paige replied her voice fading for the last part of her response. “Then I will accept your offer.” The swordsman turned around and held out his hand like one would for a handshake. Paige lifted her head and her gaze fixed on his outstretched hand, she reached for it but with her left hand. Their tips of their fingers touched. Realizing what she had just done; she retracted her hand in embarrassment, her cheeks turning red. Slowly however her slightly parted lips curved into a smile and she began to laugh, whether it was out of embarrassment or shyness, she couldn't tell. She looked up at the swordsman and instead of his always straight emotionless face; it was lit up a bit, his lips were curved into a slight smile. And now she knew that the smile on her lips wasn't from embarrassment or from being shy, but from joy. Her True Calling. . .